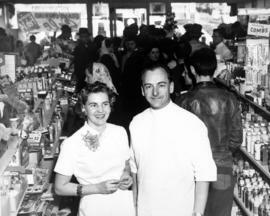 Item filed under Retail and commercial development. 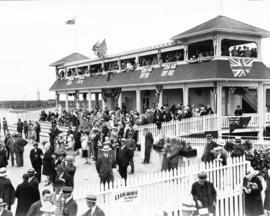 Photograph also shows trains and tracks running under the viaduct. 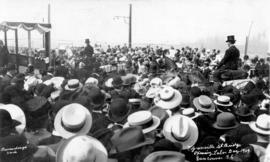 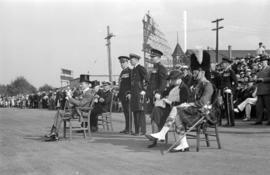 Granville St. Bridge Opening Labor Day 1909 Vancouver B.C. 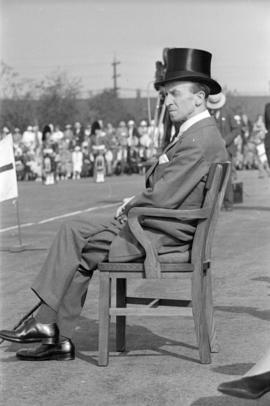 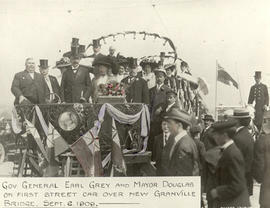 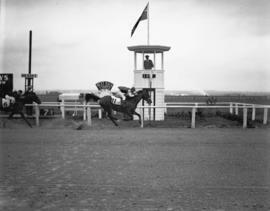 Photograph shows Governor General Earl Grey stepping out of the first carriage. 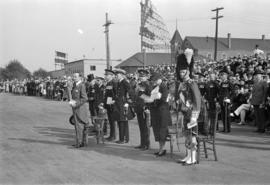 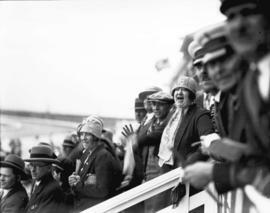 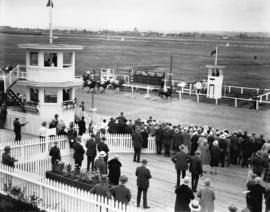 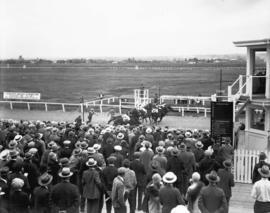 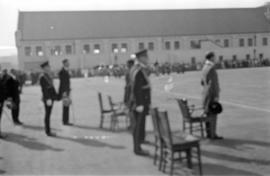 Photograph shows officials greeting Connaught, with spectators behind a barricade in the background. 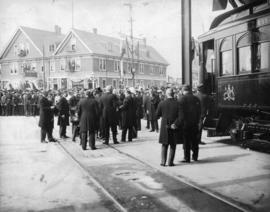 Part of a streetcar is shown on the right. 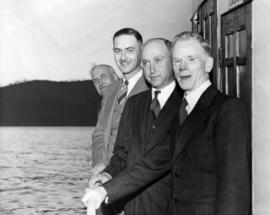 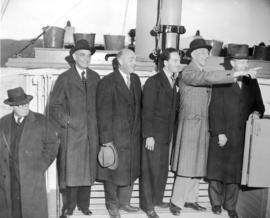 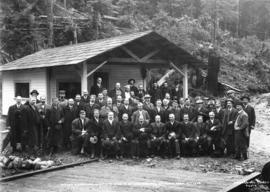 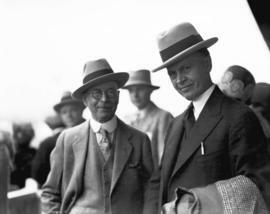 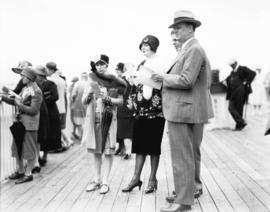 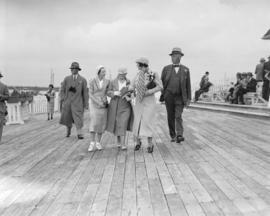 Photograph shows on board S.S. "Comox" (L to R): Reeve J.B. Leyland; Carl I. Halterman, General Manager of Union S.S.; Norman Philp, Superintendent of Passenger Services; and J.M. 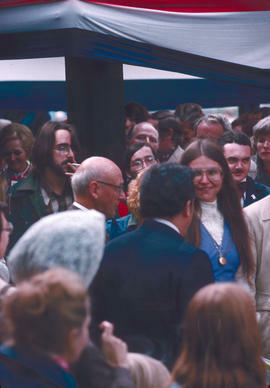 Bryan, M.L.A. 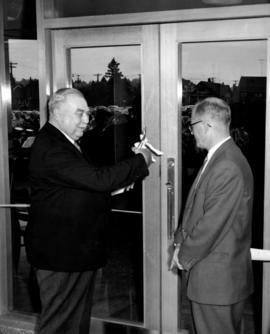 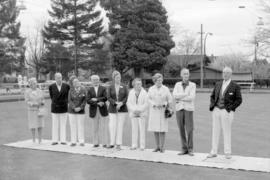 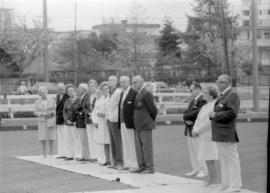 Kensington Community Centre : official opening : June 21, 1980 : 2 p.m. 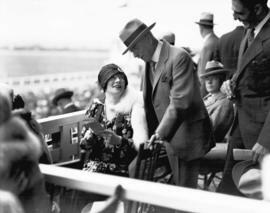 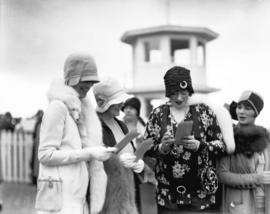 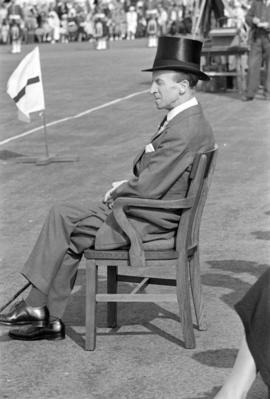 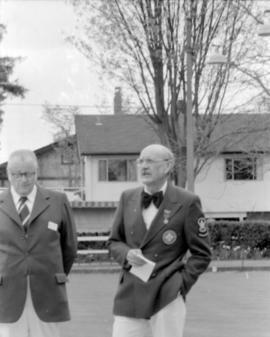 Item includes a history of the centre and list of board members. 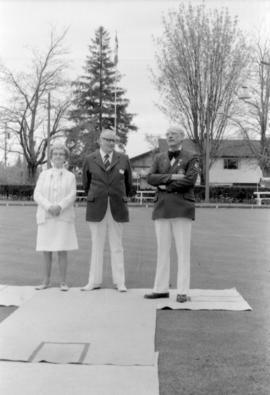 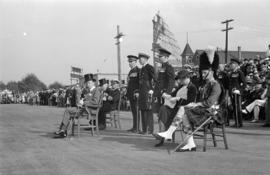 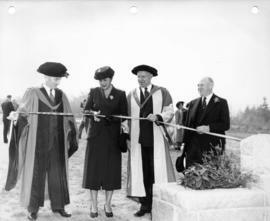 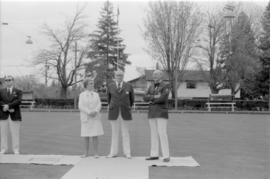 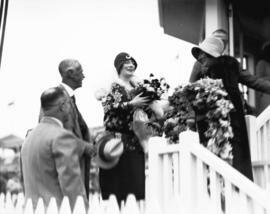 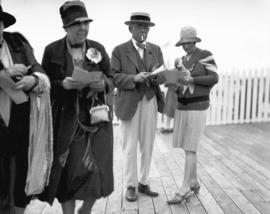 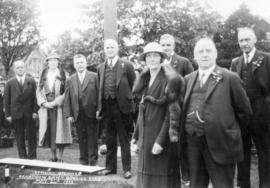 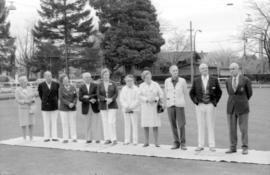 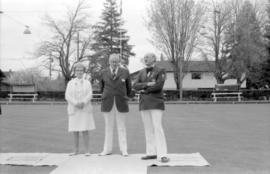 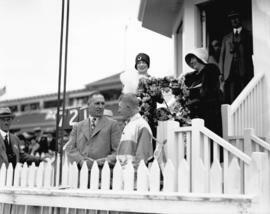 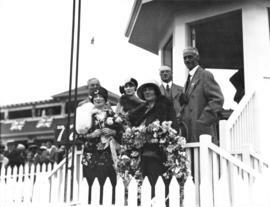 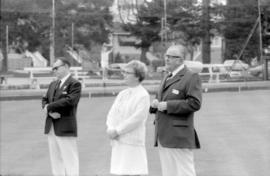 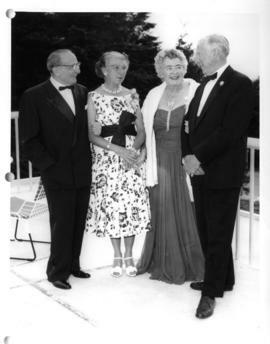 Item is a group photograph of (from left to right) Leon Koerner, Mrs. Margaret MacKenzie, Thea Koerner, and University of British Columbia President Norman MacKenzie, on the occasion of the official opening of the U.B.C. 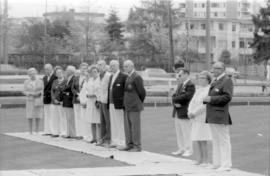 Faculty Club. 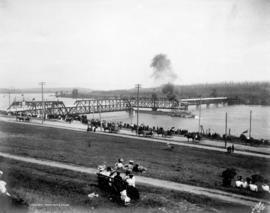 Photograph shows a steamboat passing through the open span.